German Ifo Business Climate, Haruhiko Kuroda’s speeches, US and Canadian GDP data, US Core Durable Goods Orders, Unemployment claims and Housing data are the most important economic releases for this week. Here is an outlook on the highlights coming our way. Last week, the FOMC Meeting Minutes release showed the Fed is concerned with low inflation but expects firming further out. Since quantitative easing ended, the key issue is the timing of the first rate hike. Some FOMC participants wanted to remove “considerable time” in the statement while others did not. Global economic issues such as the weakening in Europe, China and Japan and their possible impact on the US market, were also discussed. The Fed also noted the US economy continues to improve gradually. The December statement may shed more light on the timing of policy changes. Eurozone German Ifo Business Climate: Monday, 8:00. German business sentiment declined for the sixth month in October, reaching 103.2 after September’s reading of 104.7. Economists expected a smaller decline to 104.6. Growth in the third quarter was worse than expected with a predicted gain of 0.3%. The survey revealed a drop in current conditions to 108.4 from 110.5 in September and the outlook gauge declined to 98.3 from 99.2. Analysts predict business climate will reach 103 in November. Haruhiko Kuroda speaks: Tuesday, 0:00, 3:45. BOE Governor Haruhiko Kuroda will speak in Nagoya and in Tokyo. Kuroda warned inflation could fall below 1% the disappointing GDP release in November showing the economy slid into recession. BOE Governor started to implement the unprecedented asset purchases decided in the last policy meeting, despite Prime Minister Shinzo Abe’s decision to delay a sales-tax increase. Kuroda may provide clues on further easing measures to boost inflation towards the 2% target. US GDP data: Tuesday, 12:30. The US economy grew at a faster pace in the second quarter than estimated earlier. Gross domestic product grew at an annualized rate of 4.2%, 0.2% higher than expected. Business spending turned out better than initially estimated. Corporate profits after tax totaled a seasonally adjusted annual rate of $1.840tn, up 6% from $1.735tn in the first quarter. Personal consumption expenditures rose 2.5% in the second quarter, compared with an increase of 1.2% in the first. Durable goods increased 14.3%, compared with an increase of 3.2% in the previous period. Economists expect GDP to reach 3.3%. US CB Consumer Confidence: Tuesday, 12:30. U.S. consumer confidence edged up strongly in October, hitting a seven-year high of 94.5 from 89 in the previous month amid a further improvement in the Job market raising expectations for higher economic growth. In light of falling gas prices and better job figures, consumer spending is expected to rise in the coming months. U.S. consumer sentiment is predicted to rise to 95.9 this month. 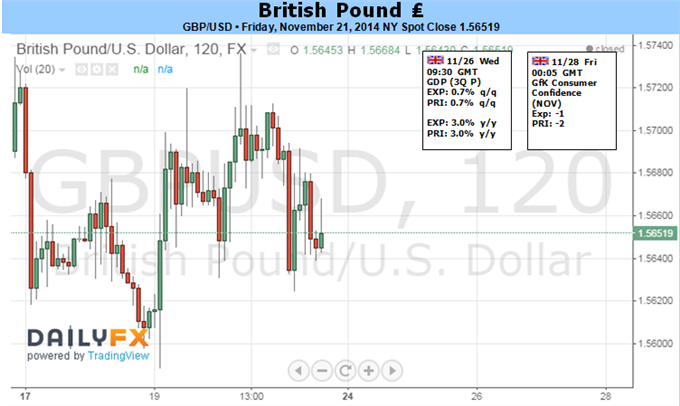 UK GDP data: Wednesday, 8:30. The U.K. economy kept growing in the second quarter, expanding by 0.8% as in the previous quarter. The reading was in line with market forecast, rising a revised 3.2% from a year earlier. Economists expect the Ukraine crisis will have negative bearings on the manufacturing sector due to a reduction in foreign demand. However once tensions ease, business confidence and investment will rebound across Europe, and the UK will return to full growth. The third quarter growth rate is expected to be 0.7%. US Core Durable Goods Orders: Wednesday, 12:30. Orders for long lasting goods fell unexpectedly by 1.3% in September, while expected to gain 0.4%. Excluding transportation orders, durable goods orders declined 0.2% and fell 1.5% excluding defense orders. Nondefense new orders for capital goods in September fell 5.4%, while defense new orders for capital goods rose 7.4%. However, the general trend is positive showing a stronger market demand, while aircraft orders tend to be less trustworthy. Analysts expect a decline of 0.4% in Durable Goods Orders and a 0.5% gain in core orders. US Unemployment Claims: Thursday, 12:30. The number of Americans filing claims for unemployment benefits fell last week to 291,000 from 293,000 in the week before. Economists expected a sharper decline to 286,000. The reading continues to suggest an ongoing improvement in the US labor market. The four-week moving average, a more stable gauge, increased 1,750 to 287,500, still showing job growth. Economists forecast 287,000 new claim this week. US New Home Sales: Wednesday, 14:00. Sales of new U.S. single-family homes reached a six-year high in September, rising to a seasonally adjusted annual rate of 467,000. Economists expected an even higher reading of 473,000. August’s reading was sharply revised for the worse to 466,000, indicating the housing recovery remains uncertain. The housing market regained momentum after stalling in the second half of 2013 when mortgage rates soared. Mortgage rates have declined hand in hand with the contraction in the U.S. Treasury debt yields, but slow wage growth weighs on the pace of recovery. Analysts expect new home sales to reach 471,000. Canadian GDP: Friday, 12:30. Canada’s economy contracted unexpectedly 0.1% in August, declining for the first time in eight months, amid a decline in energy and manufacturing activity. Economists expected a flat reading as in the previous month. The disappointing figure suggests pickup has stalled in the third quarter. Manufacturing output fell 1.2%, reversing the 1.2% gain in the prior month. Service industries gained 0.2% for the month, with wholesale trade gaining 0.5% and the finance and real estate sectors both rising 0.3% in August. Retail activity, however, declined 0.1% and transportation and warehouses dropped 0.3%. Economists forecast a 0.4% gain in September. From a fundamental perspective, the Dollar’s interest rate backdrop seems to be mired in debate over the timing of the inevitable first hike. Technically, many of its pairings have extended to multi-month or multi-year highs with large boundaries looming just ahead. And, perhaps most condemning for momentum is the ‘market conditions’ consideration of a seasonal liquidity drain for the financial markets for the US-based Thanksgiving holiday. Despite all of these factors, however, the Greenback is more likely to extend its stretch of volatility – and perhaps even extend its drive – as the market appreciates its ‘relative’ appeal. In a vacuum, the Dollar’s fundamental bearings have grown mixed as of late. Employment figures still show improvement on payrolls, but wages and participant are struggling to catch traction. Sentiment indicators are leveling off after broadly climbing to multi-year highs. Housing data is starting to tremble and manufacturing readings have slipped. A tempered pace of growth would be a concern if it weren’t for the reality that the United States’ peers are in far more troubled circumstances. Nowhere is the disparity in performance playing to the Greenback’s favor more than with monetary policy. Cooler global winds, the FOMC’s softer tone on perceived inflation threats and a thinly disguised desire not to upset financial markets has kept Fed from solidifying near-term rate forecasts. The markets are certainly unsure about the path of rates as Eurodollar and Fed Funds futures (used to hedge interest rates) project the first hike around September or October of next year. The pace thereafter is seen as very conservative. Yet, the September FOMC forecasts still stand – the central bank made an effort to say its view was unaffected by the October market correction, unlike investors’ view – and the Primary Dealers survey conducted by the New York Fed both maintain a mid-2015 or June move is still most likely. As vague as the Fed’s hawkish path is, it is nevertheless ‘hawkish’. That contrasts dramatically from its major counterparts. The Bank of Japan has upgraded its open stimulus program back in October, while the 3Q recession and expected delayed tax hike add to forecasts. China offered up an unexpected upgrade of its own with the first interest rate cut in two years. And, the European Central Bank is on a path of steadily growing accommodation with a full-blow, government bond-centered program seeming not far away. These are the United States’ largest economic counterparts and their respective currencies the Dollar’s most liquid foils. Their descent indirectly lifts the US currency. The influence that this relative monetary policy perspective (along with its growth, return and other fundamental implications) has over the Forex market – much less the Dollar – can keep the volatility fires burning for the asset class through the coming week. That is remarkable as the US-based Thanksgiving holiday period often breaks the transmission of risk trends and quiets the capital markets. With the persistent turmoil and pace of policy changes from the rest of the world, the financial system may override the seasonality effect of Thanksgiving. And, even if traditional assets like equities settle; the FX market is far more responsive to ‘mon pol’. As our attention is set on the most productive fundamental theme (rate / stimulus forecasts) though, we must not write off the threat that an ill-turn in ‘risk’ poses. Given the state of leverage, participation, portfolio balances and asset prices; sentiment can be extremely mercurial. 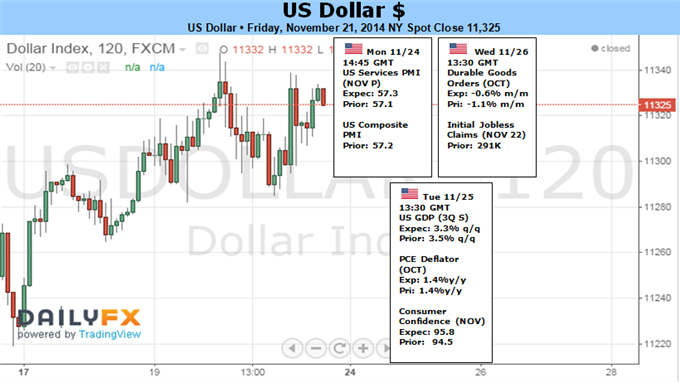 Should confidence bend, we are in for a far deeper well of market adjustment will follow…with heavy Dollar gains. The markets responded with relative indifference to what might’ve been expected to be volatility-inspiring news-flow out of Japan last week. Third-quarter GDP figures showed the economy sank back into recession. This triggered Prime Minister Shinzo Abe to dissolve the lower house of the Diet and call a snap election for mid-December to win a mandate for delaying next year’s sales tax increase. The Yen largely acted as if nothing happened, with prices continuing to drift higher against the US Dollar at the same measured pace seen over the last three weeks. For its part, Japan’s benchmark Nikkei 225 stock index oscillated in a narrow range having set a seven-year high. Such complacency seems to reflect a market that was amply primed for what was to transpire. Indeed, data from Bloomberg shows media mentions of a possible sales-tax hike delay began to build as early as three weeks ago. Furthermore, investors seem rather sanguine about the whole ordeal. This seems to make sense. Doubling the sales tax from 5 to 10 percent was a central policy fixture of the DPJ administration of Yoshihiko Noda, Mr. Abe’s predecessor. The Prime Minister shrewdly allowed the first phase of the increase – from 5 to 8 percent – to take effect this year. He probably figured that he could claim a deficit-fighting victory if the economy took the move in stride or score a win against the DPJ if it didn’t. The latter seems to be playing out and Abe has dutifully called an election in response. His aim is surely to use the onset of recession to trash the DPJ’s economic stewardship and secure a broader grip on power. Given the distinctly expansionary nature of “Abenomics”, it seems hardly surprising that the markets are not perturbed by the prospect of giving the current administration a freer reign. External factors may disturb the calm however. 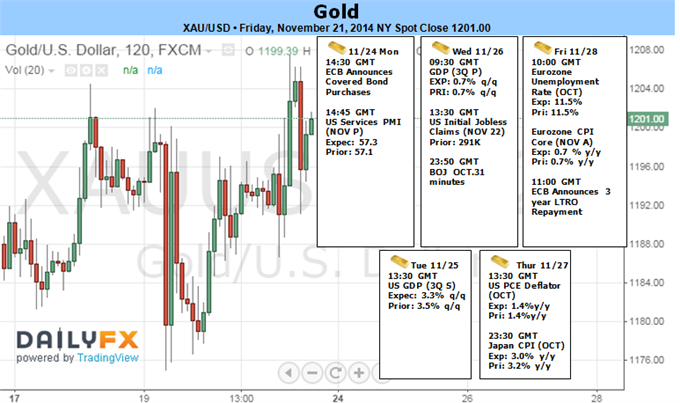 US economic data began to gather upward momentum relative to consensus forecasts once again last week. More of the same as consumer confidence, home sales, and durable goods orders figures cross the wires in the days ahead might fuel speculation that the Fed will move sooner to deliver its first post-QE3 interest rate hike. That may set off risk aversion, pushing the Yen higher amid liquidation of carry trades funded in terms of the perennially low-yielding currency. Seasonal forces may amplify this dynamic. While risk appetite flourished in 2014, the generally accepted expectation of on-coming Fed stimulus withdrawal surely casts doubt on more of the same next year in the minds of investors. That may fuel a desire to book profits on risk-sensitive exposure as the year-end holiday cycle gets underway, securing yearly performance numbers ahead of what might be tougher times ahead. GBP/USD may face a more meaningful rebound in the week ahead as the Bank of England (BoE) highlights the risk of overshooting the 2% target for inflation, while the Federal Reserve remains reluctant to move away from its zero-interest rate policy (ZIRP). With the BoE scheduled to testify in front of the Parliament’s Treasury Select Committee next week, the fresh batch of central bank rhetoric may heighten the appeal of the British Pound should Governor Mark Carney continue to prepare U.K. households and businesses for higher borrowing costs. Even though the BoE Minutes showed another 7-2 spit at the November 6 meeting, it appears as though there’s a greater dissent within the Monetary Policy Committee (MPC) as the faster-than-expected erosion of economic slack raises the risk for above-target inflation. In turn, we may see a growing number of BoE officials scale back their dovish tone for monetary policy, while the Fed may further delay its normalization cycle amid the subdued outlook for U.S. inflation. The preliminary 3Q U.S. Gross Domestic Product (GDP) report may serve as another fundamental catalyst to drive GBP/USD higher as market participants anticipate a downward revision in the growth rate, while the core Personal Consumption Expenditure, the Fed’s preferred gauge for inflation, is expected to grow an annualized 1.4% after expanding 2.0% during the three-months through June. As a result, central bank Chair Janet Yellen may largely endorse a more neutral tone for monetary policy going into the end of the year, and 2015 rotation for the Federal Open Market Committee (FOMC) may further dampen the appeal of the U.S. dollar as central bank hawks Richard Fisher and Charles Plosser lose their vote. With that said, GBP/USD may make a larger attempt to break out of the narrow range on the back of hawkish BoE commentary along with a series of dismal U.S. data, and we would also like to see a topside break in the Relative Strength Index (RSI) as the oscillator retains the downward momentum carried over from the previous month. 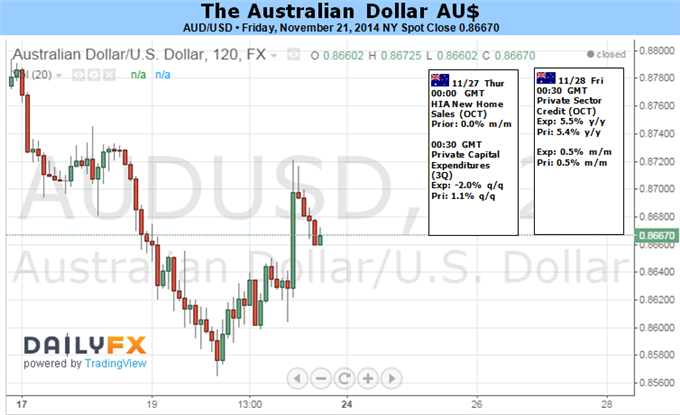 The Australian Dollar witnessed another week of intraday volatility, yet limited follow-through. Local economic data once again proved uneventful for the currency, amid well-anchored RBA policy bets. Indeed the latest Minutes reiterated the central bank’s preference for a “period of stability” for rates and offered few fresh insights into policy makers thinking. Looking to the week ahead; local Capital Expenditure and New Home Sales data headline the domestic economic calendar. Rampant speculative lending in the housing market has been a concern for policy makers and has created a reluctance to cut rates further. However, the rather volatile upcoming home sales data is unlikely to materially alter the rate outlook. Similarly, it would likely take a significant surprise to the Capex figures in order to change policy bets. This in turn could continue to leave the Aussie to take its cues from elsewhere. One of the biggest threats to the currency remains the potential for a further pick-up in implied volatility. Measures like the CVIX are near their peaks for the year suggesting traders are anticipating some large price movements amongst the major currencies. Such an environment generally bodes ill for the high-yielding currencies, who stand to outperform in low-volatility settings. Meanwhile futures positioning suggests the wave of short-selling has turned into a trickle. Yet it remains off the extremes witnessed last year, suggesting more room may exist in the trade. Gold prices are higher for a third consecutive week with the yellow metal rallying 0.8% to trade at $1197 ahead of the New York close on Friday. The advance comes on the back of dovish rhetoric out of the ECB and a surprise move from the PBOC to further ease monetary policy. Although recent fundamental developments are becoming increasingly supportive for gold, near-term the rally may be at risk as prices hold just below the 2014 open. Gold prices stretched into fresh three-week highs on Friday after the People’s Bank of China made a surprise rate cut to its benchmark interest rates in an attempt to further support economic growth. The central bank lowered one year deposit rates by 25 basis points to 2.75% while one year lending rates were slashed by 40 basis points to 5.6%. The announcement comes just as ECB President Mario Draghi renewed the central bank’s pledge to combat slow inflation in the region. In comments made at the European Banking Congress on Friday Draghi cited, “We will do what we must to raise inflation and inflation expectations as fast as possible, as our price stability mandate requires of us.” He went on to note that if further risks to the outlook materialize, the ECB remains posed to, “altering accordingly the size, pace, and composition of our purchases.” More accommodative monetary policies are generally supportive for gold as expectations for faster inflation stoke demand for the yellow metal. With that said, the key event risks for the week ahead surrounds the Swiss Gold Referendum, where a ‘Yes’ vote could substantially change the composition of the Swiss National Bank’s balance sheet. The central bank would be forced to increase its holdings of the precious metal with the new guidelines, which could amount to a net CHF 66B in new purchases. Beyond the Swiss vote, the advance 3Q U.S. Gross Domestic Product report may also boost the appeal of bullion amid expectations for a downward revision in the growth rate, and the precious metal may remain well supported in the week ahead on the back of a weaker U.S. dollar. Last edited by 1Finance; 11-22-2014 at 12:29 PM. The NASDAQ had a slightly positive week, but at the end of the day it’s really not that big of a deal. After all, we managed to break a little bit higher, but the market seems to be running out of steam as we had initially had such a parabolic move higher. We believe that pullbacks will be looked at as value, and that’s probably the best way to get involved in buying this market. With no interest in selling, this market is far too strong at this point in time. The gold markets broke a little higher during the course of the week as we continue to try to build a little bit of a base. The $1200 level above is resistive, and we think that there is plenty of resistance above as well. That being the case, we feel that longer-term traders will be better served looking for resistive candle in order to start selling again. We do not have it at this point in time, so we believe that longer-term traders will probably step away from this market for the time being. 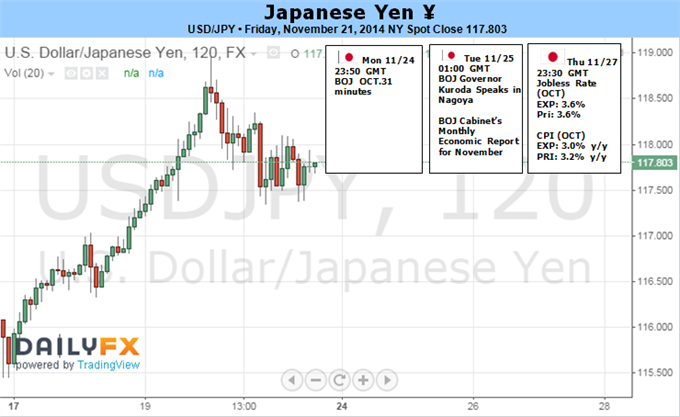 The USD/JPY pair rose during the course of the week, testing the 118 handle. That being the case, we feel the market is ready to go higher and that pullbacks will continue to be buying opportunities. The market should head to the 120 level, which of course is the next large, round, psychologically significant number. We have no interest whatsoever in selling this market as the US dollar is so strong, and of course the Bank of Japan is working so hard against the value of the Yen.